When you’ve got to get somewhere, why should you let anything stop you? That’s the lesson from one elderly man in Fairfield, Connecticut. Despite not having a car (or being able to drive one on the interstate), he was still able to get around thanks to a Rascal scooter-type of vehicle. 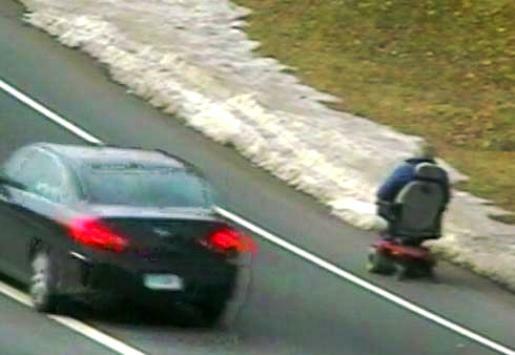 Eyewitnesses saw an elderly man in a blue jacket driving an electric wheelchair in the breakdown lane of I-95. Talk about strange things to see! Of course, driving an electric wheelchair on the interstate is illegal. Illegal and dangerous. But also, it’s kind of awesome. Good for this guy. I mean, given his relative age (or my best guess of it) and the fact that he’s in poor health enough to use an electric wheelchair, what’s he got to lose by going onto the highway? It’s got to be safer than hitchhiking and it’s definitely economical when it comes to miles per gallon of gas. He’s lucky the police didn’t catch him speeding, though.